OK, been busy so it's been quiet in here for a little while. But following the piece a few weeks ago on my attempted lifestyle change I can confirm that around half a stone has vanished in three weeks with a belt notch being tightened on my suit yesterday. No, it didn't hurt and yes, I know leather stretches so this probably wasn't a whole "notch" in real terms. The exercising I mentioned - using a skipping rope - hasn't gone quite so well. I've been testing some socks from Runbreeze and can confirm that if you find ankle socks/trainer liners comfortable they certainly do the job of cushioning your foot and keeping you cool just as you'd hope. 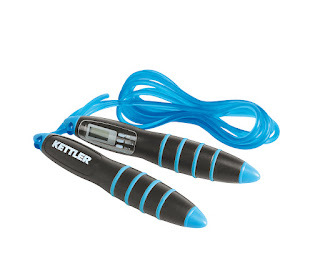 I've been using a digital skipping rope (pictured) from Kettler. I can confirm that this does the job - counts the time you've been working out, tells you about the calories you've been burning, or at least it did until I let my daughter loose on it. It came back with the display dead, I have no idea why, she couldn't have run out the battery that quickly. Nonetheless it's still fine as a skipping rope, albeit one with a lighter cord than many people will be used to so you have to work harder to get it over your head. This is where the other component comes into play; you know, the unco-ordinated, immovable heavy lump attempting to skip for the first time in forty years when he wasn't particularly good at it anyway. I tend to last about two minutes before getting tangled up, so if I'm honest the 'cardio fix' running alongside the calorie reduction hasn't gone quite to plan. I will persist. Still, three weeks, half a stone. I'm not at all distressed at that so far. Here's a nice idea. 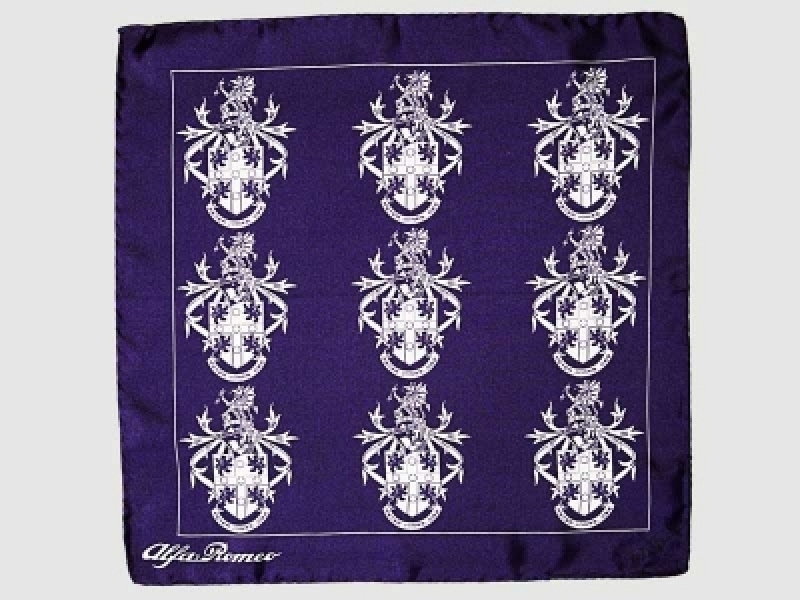 Car manufacturer Alfa Romeo (don't look at me, can't afford one) is issuing some pocket squares. The proceeds go to Heart Research UK. Now, my dad died of a heart attack when he was not far from my own age (2 years in it) and that is my justification for spending £45 on three of the things. My favourite is the one designed by actor Tom Ellis - him off Miranda - and I also like the one by Peter Jones (pictured) and bought the PPQ one too because I wanted something in black and white. The idea is that you show your support and knowledge of heart conditions by wearing one. I can't help but feel this is a bit of a cop-out; I'd rather think about looking pretty reasonable because I'm wearing one and giving a donation as separate things. 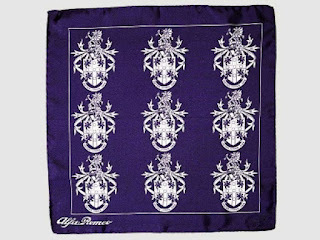 Pocket squares are odd. When I started wearing them my wife said I was looking a little too dandified. I thought more people were wearing them than she thought, and now they're just about everywhere. The trick is to wear them toning with rather than exactly matching your tie, otherwise they look like you've bought a job lot. These Alfa Romeo editions are nicely designed, competitively priced (check Ralph Lauren or something for an equally good look and watch yourself paying double) and in a good cause. Click here to have a look at all six, find out about the designers including the aforementioned, Olympians and actual designers, and do buy one. OK, it's like this. I'm heading towards 'can no longer claim I'm in my mid-forties' territory, and my dad died when he was 49. I don't smoke so I'm not that worried - much - but I'm aware that my weight, for example, is not my best friend. It's 50 mins or so long but worth a look. I've also received a pair of sports socks which I'll be testing for this blog and have been promised a digital skipping rope on test, too. I will let you know how I get on. At the moment I'm wearing 38in waist jeans from Wizard with a certain abdominal overhang (that's claret-gut to most). By Christmas I'd like a considerably flatter stomach and to be getting comfortably into 34in. Why am I doing it this way? Because a couple of weeks ago I had the house to myself a few days. I thought, right, I can do something about this. I can go to the gym because there's no distraction, nobody to remind me that the lawn needs mowing or something, nothing to get in the way. And work being work, I didn't. I just couldn't find the time. This tells me that my lifestyle needs changing urgently; if you can't look after yourself, Clapperton, you're going to go the same way as your father. My brother was 14 when our dad died; I'm not going to voluntarily leave my daughter at the same point in our life. But I have to work. So, 15 mins skipping in the garden before a shower involves no travelling time, no real inconvenience, just getting up marginally earlier. And cutting down to 600 calories two days a week involves very little in the way of interfering with work appointments and soforth - I should be able to fit perfectly happily around other people, they won't notice. With a bit of luck it'll cost me a fortune at the tailor because everything will need taking in. Oh, and in case you're wondering, yes - announcing this in public is intended to help encourage others to do something similar where they need to, but also to embarrass me into keeping it up. I can't tell you guys I'm going to lose weight and then not do so. I'll let you know how it goes.